Lol at his attempt of a suso impression. Not even close. Lol! Not even Maradona was bestowed this. FYI... Messi's record for Arg is nothing to write home about. All of his WC goals came in the group stages vs fodder opposition. But as a player Messi is pretty one dimensional... U know what his next move is... Its just a matter of anticipating it. Where as the likes of R9 and Diego could beat the opposition in a variety of ways. They could also score a whole variety of different goals. If we are to out messi alongside the like of Diego and R9, then we might as well put Beckham and totti in the same category as Zidane, Ronaldinho etc etc. 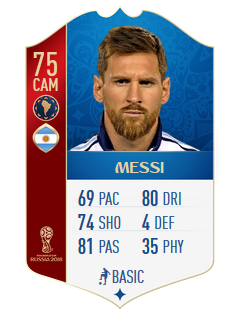 he sucked more than maradona in copa america? but my question was if he manages to win it in russia and plays like he plays in barca, then you ll consider him as great as maradona>?